The holidays are always a busy time for retail brands and with more people than ever doing their holiday shopping online, brands need to focus on their digital strategies to make the most out of this shopping season. 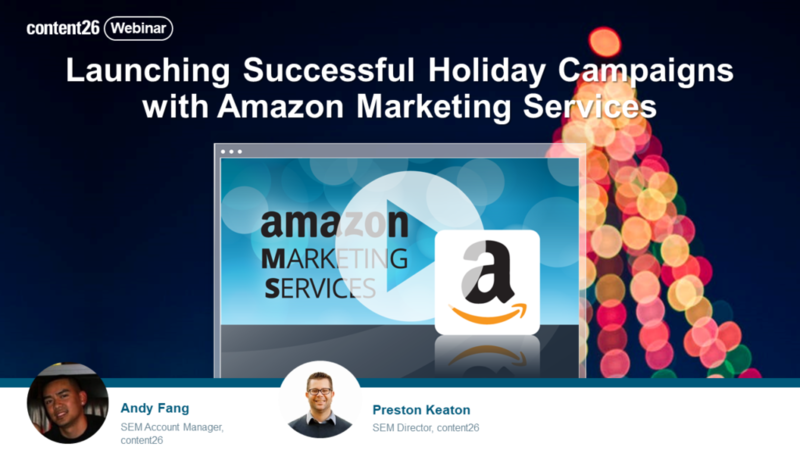 In this webinar, content26 SEM Director Preston Keaton and SEM Account Manager Andy Fang outline a series of tips for brands looking to launch successful Amazon Advertising holiday campaigns. They overview how to select the right holiday products to showcase, how to test campaigns to ensure they’re working effectively, and the importance of bidding aggressively on CPCs while closely monitoring your budgets. Sign up for this on-demand webinar to learn how to use Amazon Advertising to get the most out of your holiday Amazon strategy. Published on October 25, 2017.